After much time away dealing with the birthday party stuff, I am finally getting around to how I did the grab bags. This will be a 2 part series covering each bag, the materials used, and the steps I took to create them. The idea for this grab bag came from a Pinterest pin and I just looked at it once and was able to go from there. 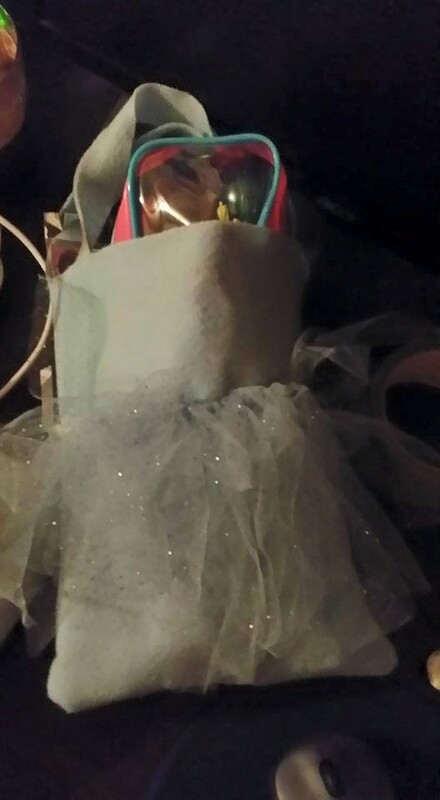 Blue Tulle- I found out that I could have gotten this on a roll from Fabricland but I lucked out and my aunt sent me some down so I didn't have to buy it. White Satin Ribbon (to attach the tulle to)- I think that I got 1/4 inch for this and a meter of it to make sure I had enough. Baby Blue Felt (sparkly or not)- I used a felt square that I found at Fabricland but I noticed while I was there that they also had rolls of them that you can choose how much you need (by the meter) I didn't need much as this was something special for my children so I just grabbed 4 squares of the felt. Now here comes the fun part.... SEWING IT!!! Well not yet... First cut out a pattern 8 inches wide by 10 inches long (we used printer paper for this step.) Cut out felt using the pattern so that it is the right size. I made a pattern for the handles too (just to make sure that I made them the right size.) All I did for the handles was to make a 1 1/2 inch wide line on a new piece of printer paper and then cut it out. After it was folded in half it was the perfect size! Pin the felt pieces together and make sure your sewing machine is ready to go. Stitch around the right, bottom, and left sides leaving an opening for all the goodies that you are wanting to fill it with. Attach the handles to the bag and then turn the bag so that the seams are on the inside. Next loosely tie the white satin ribbon around the outside of the bag. Attach the tulle to it by making a half circle behind the ribbon and pulling the ends through the half circle (see the link below.) Once that was done we knotted the ends of the ribbon and ran a quick stitch on the ribbon to keep it in place. All done! The picture is what I made.